AC waves in Aluminium Welders allow the process of fusing aluminium components together to occur. During the GTAW process the polarity of the welding arc changes and is either removing aluminium oxide from the surface (tungsten positive) or adding heat to the weld pool (tungsten negative) . 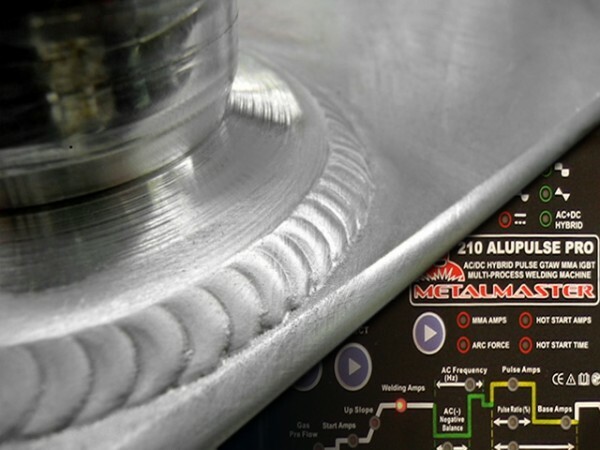 The AC tig welding process is best for aluminium welders and is only slightly exceeded by hybrid wave processes that include a DC component. The latest Hybrid wave Tig process injects a small DC interlude between the AC cycle. When performing a weld on aluminium material the AC arc is balanced between cleaning and penetrating with the percentages varying based on the operator’s choice. The penetration may be less due to the need for a high amount of cleaning action. The DC component is negative at the tungsten electrode and positive at the work piece therefore is 100% penetrating. The net result is that the aluminium tig process gains additional heat input resulting in deeper penetration. The use of and inverter power source welder makes this complicated process much simpler because the electronics at the transformer input control current which is much smaller than at the output of the transformer. One often confusing fact for many novices is that they are not aware inverter power welding machines contain a transformer. The suitability of any tool in the work place is best left for discussion with industry experts. Please call our sales staff on 1300 881 991 for assistance. This entry was posted in AC DC TIG Welders, Tig Welding Machines and tagged everlast digital welder, tokentools welders, welders for aluminium on August 21, 2014.